Although the concept was relatively obscure just a decade ago, today you'd be hard pressed to find a professional sports team or elite athlete who does not use the services of a functional trainer. Functional training works to strengthen the body by using movement without machine assistance. The exercises are integrated and utilize muscle groups rather than isolation because the body works and moves in an integrated fashion. 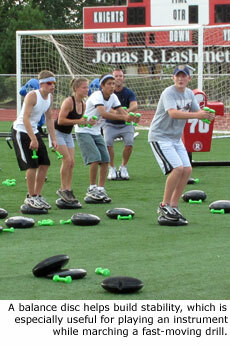 But how does functional training translate to the field where marching bands compete? Pretty well, according to the Lincoln-Way East High School Griffins, who have two Illinois state marching band championships in their pocket. "The inclusion of core and strength training in the marching program at Lincoln-Way East has transformed our students in remarkable ways," said band director Cliff Smith. "In addition to a significant increase in stamina, the students now have a far better understanding of the relationship between their own personal strength and their ability to move well on the field." 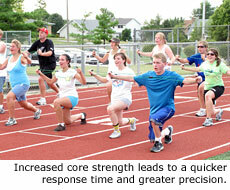 As owner of�Runonheart Personal Training, I began working with Lincoln-Way bands six years ago. In summer 2010 I will continue my work in a "boot camp" setting to share functional training techniques with more than 700 marching musicians from six different bands. Our objectives are to build basic strength from the core outward, correct muscle imbalances and build strength and endurance. • With increased core strength and endurance, band members have a quicker recovery time and a quicker response time, as well as the ability to move with greater precision on the field while playing an instrument. • Because functional training challenges the body in all planes of motion, it helps muscles fire in their proper order, reducing injuries from overuse and repetition often associated with the athletic challenges of participating in a marching band. • When combined with cardio training, the program achieves significant increases in band members' stamina, allowing directors and choreographers to create much more challenging programs. Smith said of his students, "Because they move with more power and agility, their performance quality is much less affected by the demands of their show." In addition to the physical benefits, functional training can change how teenagers think and feel about themselves. Some of my most rewarding moments are when I see students becoming more comfortable in their own skin, and when I see them reach out and try HARD to run and do the work. When the quiet, unsure teen steps out in front and leads the band in exercise, I see that the student is beginning to find himself or herself. Often that teen moves on to lead in other ways, such as becoming a section leader. My hope is that the students move on to college or adult life with a greater sense of self-esteem, and a sense of personal accomplishment that will help them tackle the challenges to come. Camps are held starting in June after the school year ends, so a 10-session camp fits easily within the pattern of the marching band year. I generally run two or three sessions per week for several weeks, take a break in July, and continue weekly maintenance sessions throughout the fall competition season. The boot camp starts with the pre-conception that students have been sedentary and are not physically fit. The program works to build core strength and balance ... crunches, "turtles" and "Vs" are trademark exercises of camp. These are often met with groans in the beginning, but a few weeks into camp, kids actually look forward to the exercises because they have begun to feel how core strength helps them prevent swayback and lower back and hip pain on the field. As camp progresses, sessions become more challenging with the addition of balance equipment. Working out on equipment like a balance disc, even playing instruments while balancing, forces the body to work harder and builds stability and strength. There are many variations of exercises utilizing this equipment. Light stretching bands are also used to relieve tight, overworked muscles in the chest, upper back, scapula and trapezoid. Beginning in the seventh session, a cardio element is added to camp. By this point the members are stronger and more stable and are ready for more dynamic work to challenge their endurance. Camps finish with a challenging run/work station circuit. What happens during a summer boot camp carries beyond the practice field, and even the competition field. Students develop self-confidence, some begin to lose weight, and many become better musicians. Eric Wellman, director of the Lincoln-Way Central Marching Knights, first utilized the Boot Camp For Bands during the summer of 2009. "The addition of a physical circuit to our marching band has been extremely beneficial to our students," Wellman said. "They are carrying themselves better, have more energy later in the year and in shows, and have more physical ability to play their instruments well. I have had positive comments from not only the students, but also their private teachers as well, in particular to the amount of air they are now able to use when performing on their instrument." My goal is to make a life-long difference in the lives of the students I train. Over the years I have run into students who have graduated from high school and gone on in their lives. When I catch up with them, their stories are always positive. Recently I met a former student who had graduated from college. He was back at home seeking employment as a band teacher at his local junior high school, and he was preparing to run his first marathon! These individual stories move me. It's WHY I'm a trainer. Because at the end of the day I have helped people become better versions of themselves. It's very rewarding. 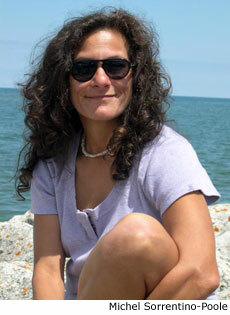 About the Author: Michel Sorrentino-Poole is a Certified Personal Trainer who currently lives in Illinois. She is a lifelong runner and she operates her own training business, Runonheart Personal Training. She currently trains onsite in Illinois, Wisconsin and Indiana, and conducts online training nationwide. For more information visit her website at Runonheartpersonaltraining.com. Text and images courtesy of Michel Sorrentino-Poole.